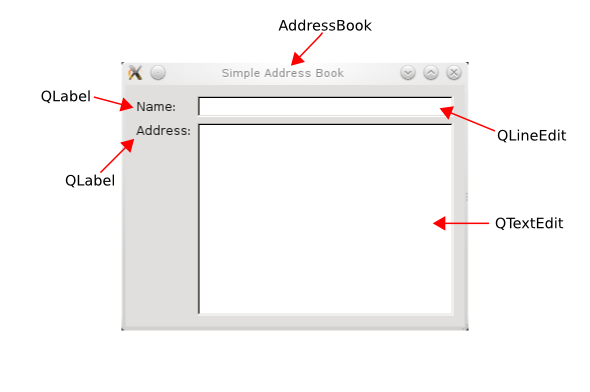 This first part covers the design of the basic graphical user interface (GUI) for our address book application. The first step in creating a GUI program is to design the user interface. 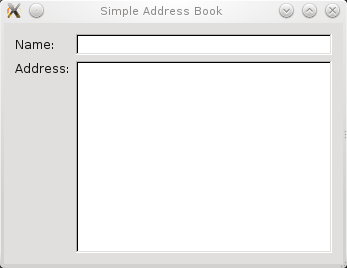 Here the our goal is to set up the labels and input fields to implement a basic address book. The figure below is a screenshot of the expected output. We require two QLabel objects, nameLabel and addressLabel, as well as two input fields, a QLineEdit object, nameLine, and a QTextEdit object, addressText, to enable the user to enter a contact's name and address. The widgets used and their positions are shown in the figure below. main.cpp - the file containing a main() function, with an instance of AddressBook. We can write implementations of virtual or pure virtual functions to obtain exactly what we need, falling back on the base class's implementation when necessary. It allows us to encapsulate parts of the user interface within a class, so that the other parts of the application don't need to know about the individual widgets in the user interface. The subclass can be used to create multiple custom widgets in the same application or library, and the code for the subclass can be reused in other projects. Since Qt does not provide a specific address book widget, we subclass a standard Qt widget class and add features to it. 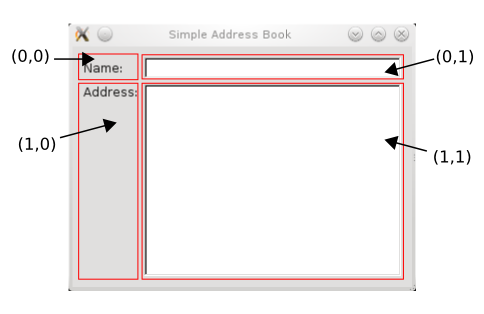 The AddressBook class we create in this tutorial can be reused in situations where a basic address book widget is needed. The addressbook.h file is used to define the AddressBook class. We start by defining AddressBook as a QWidget subclass and declaring a constructor. We also use the Q_OBJECT macro to indicate that the class uses internationalization and Qt's signals and slots features, even if we do not use all of these features at this stage. The class holds declarations of nameLine and addressText, the private instances of QLineEdit and QTextEdit mentioned earlier. The data stored in nameLine and addressText will be needed for many of the address book functions. We don't include declarations of the QLabel objects we will use because we will not need to reference them once they have been created. The way Qt tracks the ownership of objects is explained in the next section. The Q_OBJECT macro itself implements some of the more advanced features of Qt. For now, it is useful to think of the Q_OBJECT macro as a shortcut which allows us to use the tr() and connect() functions. We have now completed the addressbook.h file and we move on to implement the corresponding addressbook.cpp file. The constructor of AddressBook accepts a QWidget parameter, parent. By convention, we pass this parameter to the base class's constructor. This concept of ownership, where a parent can have one or more children, is useful for grouping widgets in Qt. For example, if you delete a parent, all of its children will be deleted as well. In this constructor, the QLabel objects nameLabel and addressLabel are instantiated, as well as nameLine and addressText. The tr() function returns a translated version of the string, if there is one available. Otherwise it returns the string itself. This function marks its QString parameter as one that should be translated into other languages. It should be used wherever a translatable string appears. When programming with Qt, it is useful to know how layouts work. Qt provides three main layout classes: QHBoxLayout, QVBoxLayout and QGridLayout to handle the positioning of widgets. Notice that addressLabel is positioned using Qt::AlignTop as an additional argument. This is to make sure it is not vertically centered in cell (1,0). For a basic overview on Qt Layouts, refer to the Layout Management documentation. Lastly, we set the widget's title to "Simple Address Book". A separate file, main.cpp, is used for the main() function. Within this function, we instantiate a QApplication object, app. QApplication is responsible for various application-wide resources, such as the default font and cursor, and for running an event loop. Hence, there is always one QApplication object in every GUI application using Qt. We construct a new AddressBook widget on the stack and invoke its show() function to display it. However, the widget will not be shown until the application's event loop is started. We start the event loop by calling the application's exec() function; the result returned by this function is used as the return value from the main() function. At this point, it becomes apparent why we instanciated AddressBook on the stack: It will now go out of scope. Therefore, AddressBook and all its child widgets will be deleted, thus preventing memory leaks.